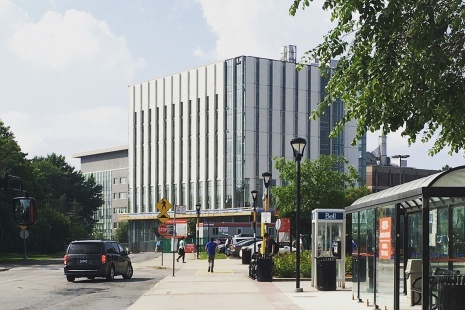 A photo taken July 25th showcases the latest progress made on Carleton’s impressive new Health Sciences Building. The New Health Sciences building, designed to co-located health sciences and neuroscience students in a state-of-the-art collaborative environment, is really beginning to take shape. With a combination of curtain wall, metal cladding, and masonry on its reinforced concrete structure, the building is slowly weaving itself into the existing campus fabric. Upcoming exterior work will see a number of pedestrian friendly features added to the site, including large porch wrapping around the ground floor, an entry quad, and a glazed link to the adjacent Steacie building. The New Health Sciences Building is slated to open later this year.